The religious periodical of the Ala Road Presbyterian Church, Pwllheli that mainly published church news and religious articles. The Home Messenger was included as a an inset to the periodical. The periodical was edited by Alfred Ivor Parry until April 1900, and subsequently by E. Myrddin Rees. 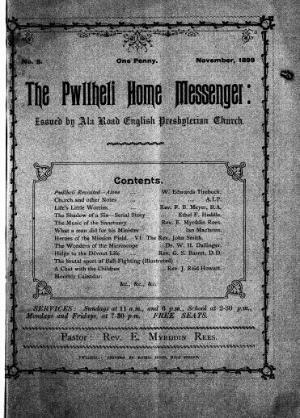 Associated titles: The Home Messenger; The Pwllheli Messenger (1902).